Men's All Over Black Celtic Ring : LOVE2HAVE in the UK! 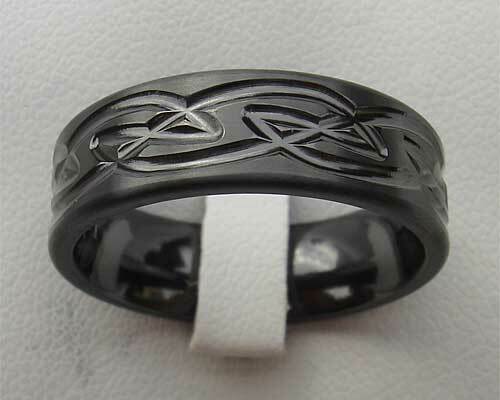 We call this men's Celtic ring an all over black Celtic ring as it is 100% black on the entire surface. This very modern but traditional men's Celtic ring made from zirconium is the other wonder metal we sell. It has a width of 7mm and is available in a satin or polished finish. The satin matte finish is pictured here. Zirconium is the only choice if you are looking for an all black ring that is designed and made in the UK. Anything else you find that is not zirconium will be imported and remember; we can offer you an after-sales service on the rings you buy from Love2Have. This ring is a superb idea if you are looking for something unique or even Gothic, but also traditional, for your wedding ring. 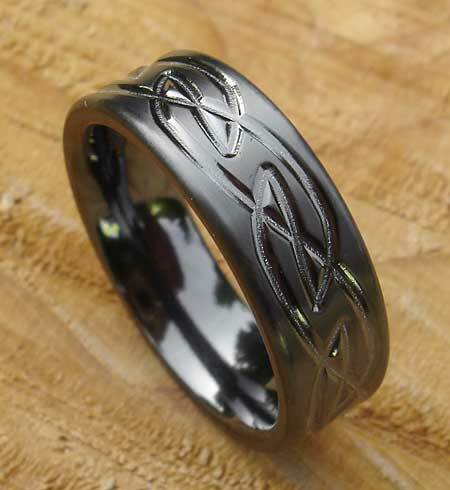 The laser engraved patterning, while very simple in design, resembles that of Celtic knot artwork - a great contemporary Celtic wedding ring for men maybe?